This homeless veteran referred to himself as “Dog.” When I asked what the city was called he said “Dogtown.” He invited us to his rather impressive tent to show us a grand painting he was quite proud of. 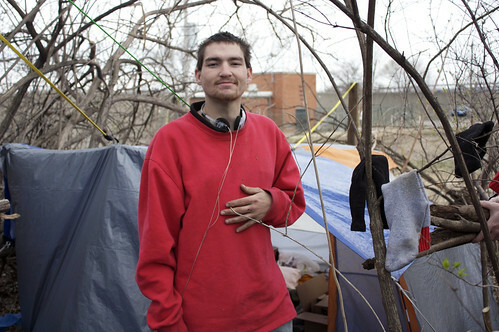 Victor has been homeless for about one year. 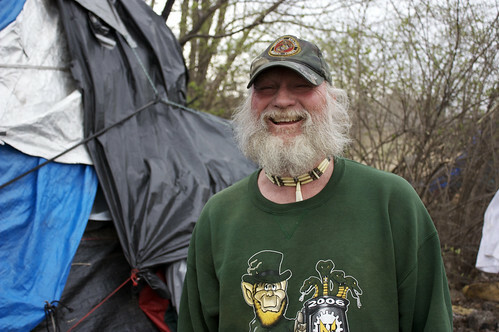 Within a stonesthrow of the Gateway Arch in St. Louis is a collective of homeless people congregated on the shores of the Mississippi River. 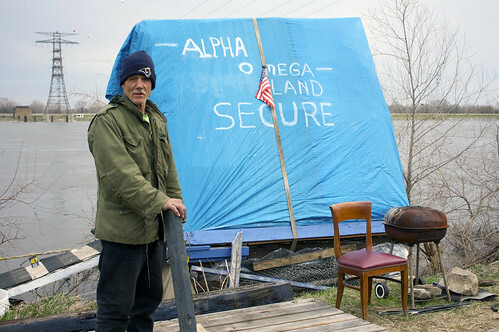 Dennis is a homeless veteran living on the St. Louis shore of the Mississippi river. He was busy constructing a method to transport his tent should the river rise above flood stage. The whole setup was quite elaborate. Dennis said that he had been living there for quite a few years. It was clear that he is quite an intelligent and industrious man. 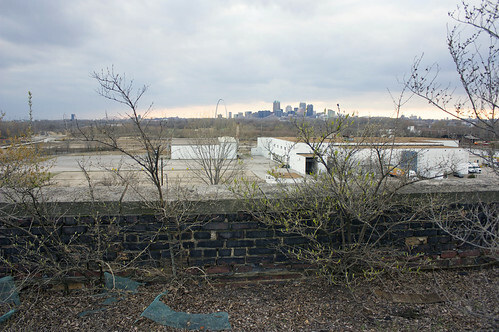 Downtown St. Louis, Missouri and the Gateway Arch are easily visible from the roof. I believe we were spotted on the roof by a passer-by in a stopped pickup truck. Drew and I decided to get out of there ASAP. Behind the Murphy Building in East St. Louis. The center of the building has collapsed inward. The main stairwell has been all but obliterated. Drew and I were not about to test the fire escape stairs. If you look closely you can see flora growing out of the brickwork. 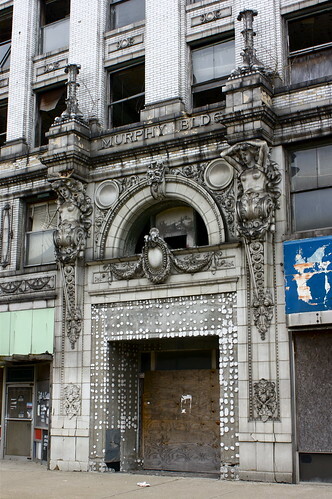 Front facade of the Murphy Building in downtown East St. Louis. 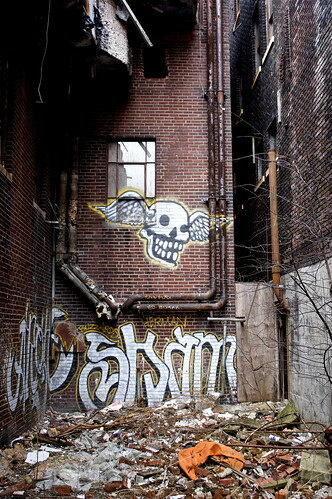 Flying skull graffiti located behind the Spivey Building. My first experience with East St. Louis came from a text I had to read during my undergrad to obtain an education degree. The article talked about the city’s school system, extreme poverty, family life and the infrastructure found in East St. Louis. The article left an indelible mark in my mind. In December 2009 my paternal grandmother passed away. The funeral was held in St. Louis. Prior to the ceremony my significant other and I drove through East St. Louis. I was fascinated by what I saw, but she was brought to tears. East St. Louis was during the early 1900’s a city with growth potential. Major railroads, cattle stockyards, and heavy industry provided ample jobs for East St. Louis citizens. 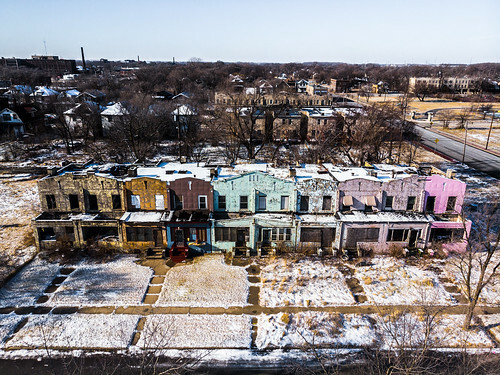 A serious of race related incidents, declining tax base, corporate wrangling, heavy industrial pollution, and a changing American economy plunged East St. Louis into extreme urban blight. The population peaked around the mid-1900s at 88,000, but has been in decline ever since. The 2000 census indicated that the population is now in the low 30,000s. I would not be surprised if the 2010 census shows even fewer. Now 3 out of every 4 residents here lives on welfare. There are a few major businesses downtown: Popeye’s, Associated Bank, BP to name a few. But the city does not have much beyond that. Third-tier businesses like hair salons and liquor stores are the most common. 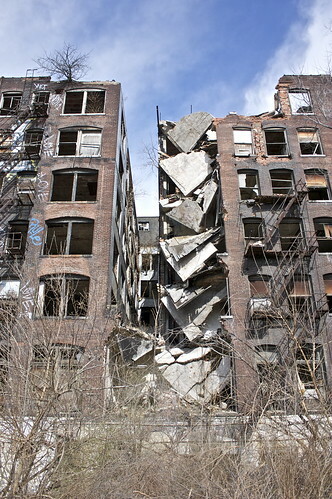 Abandoned buildings litter the city. Urban Explorers need not do much research to look for what to photograph, they just need to pick a street corner. Buildings damaged by fire are also strewn about the city. According to one resident we spoke to there had been 15 fires within the past 10 days alone. Drew and I ventured into East St. Louis with the mindset that this city is worth documenting for other Americans to see. It was an odd experience unlike any other that we had ever had before. In a city that is ~98% black, two bald white photographers certainly stick out. Drew and I have had experiences in major metropolitan areas worldwide where being approached usually means that people are looking for money or trouble. That was not the case in East St. Louis. The people we met on the street thought that we were with Habitat for Humanity or other local non-profit organizations. We told them the truth – that we were interested in who they are and how they live. They were very supportive of us documenting the sad state of their neighborhoods. 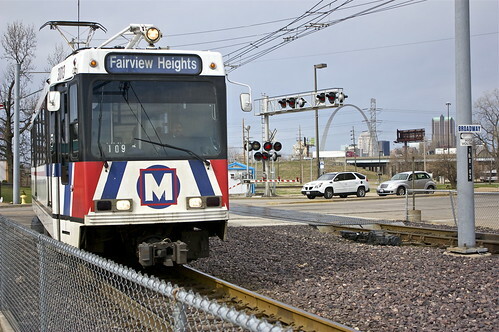 East St. Louis is a part of America, like any other. It deserves to have its voice heard. If I ever had the chance, I would return to East St. Louis. Built St. Louis – Some of the buildings in this excellent photo tour are now long gone. Savage Inequalities by Jonathan Kozol – Depicts the dire economic and education situation in East St. Louis at the start of the 1990’s. East St. Louis on Wikipedia – Obligatory Wikipedia entry on East St. Louis.